Often times during blueberry presentations or when reading some of our management guidelines, you might come across something referring to blueberry flower bud stages. A recommendation may instruct the user to apply a compound at stage 6 of bud development, for example. Or, you might hear someone say, “do not apply this compound after stage 4 of bud development”. So, what is this referring too? 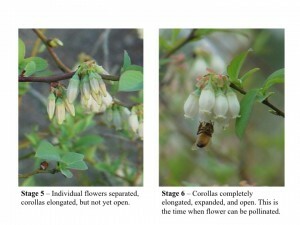 Here is a brief overview of blueberry flower bud stages, along with photos to help understand the concept more clearly. A flower bud stage scheme was developed years ago by Spiers (1978) to help designate rabbiteye blueberry sensitivity to cold damage. The stage designations we typically use in Georgia today or more or less modeled after this. Having “stages” to describe bud development helps in communication. It is too difficult to instruct usage of management or pesticides with regards to “flowering time”, as that often has varied meanings to different people. Therefore, using bud stages to describe progression of plant development improves our ability to communicate. Especially, if we all refer to the same, or at least a similar, bud stage scale. Following are updated photos of the different stages of flower bud development, along with some brief descriptions for each. Users have to keep in mind this is a simple guide. 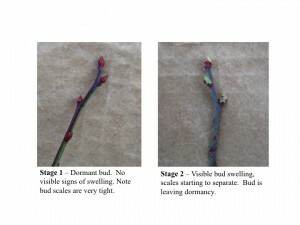 Buds can be between stages just as easily as they are at a “stage”. Once buds leave dormancy (stage 2), they progress, more or less, depending on heat units accumulated. So, on cold days buds advance very little, but when it warms up buds advance very fast. Also, buds over the whole plant are at many different stages at once (Fig. 1). Therefore, one cannot simply designate a single stage to describe a whole plant or especially whole fields. 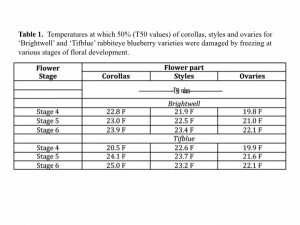 Table 1 shows data from our work several years ago on sensitivity of two rabbiteye blueberry varieties to sub-­‐freezing temperatures at different stages of bud development. 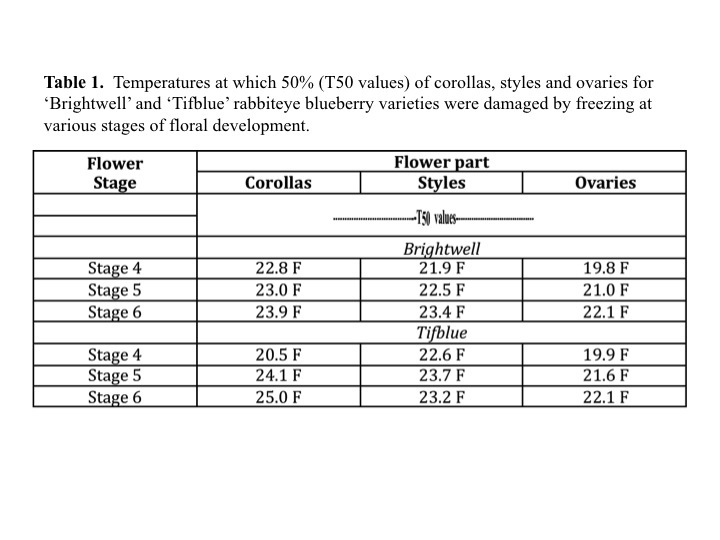 Temperatures shown are the “T50 values”, which is the temperature at which 50% of the flowers examined showed damage. 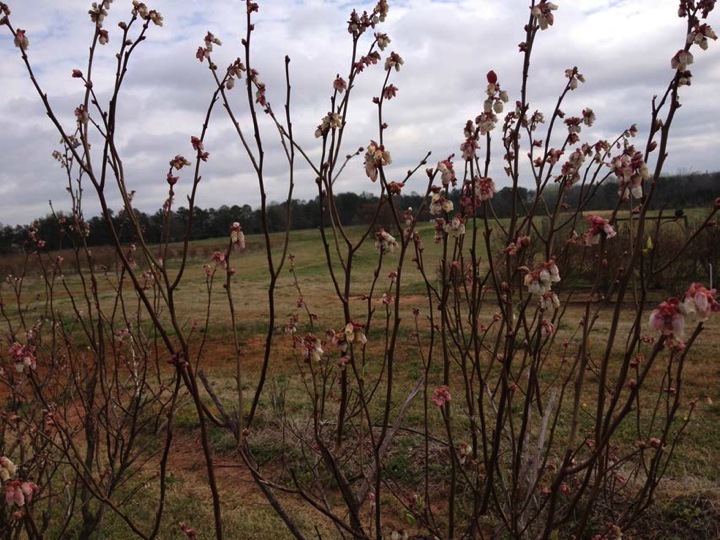 These data remind us that although there are some variety differences in cold hardiness (and typically highbush varieties are more cold hardy than rabbiteye), overall, as flower buds advance they become more sensitive to freezing temperatures. 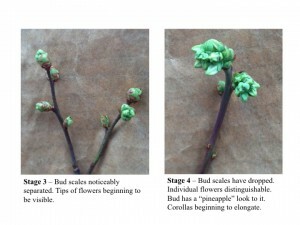 We should all familiarize ourselves with “flower bud stages”. 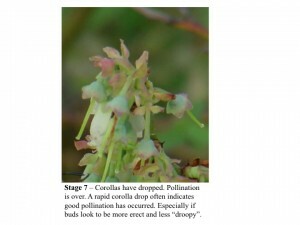 Hopefully this review helps to remind us about the progression of flower buds, and the fact that floral bud stages are good indicators for communicating what is happening with regards to plant development. Figure 1. Various flower bud stages occur simultaneous over the entire plant and field. Looking closely, flower bud stages 2 through 6 can be seen on this one plant. Spiers, J.M. 1978. 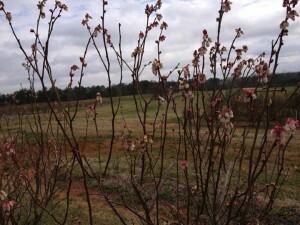 Effect of stage of bud development on cold injury in rabbiteye blueberry. J. Amer. Soc. Hort. Sci., 103: 452-­‐455. Posted in Plant Growth and Development. This entry was tagged blueberry, flower buds, growth and development, stages. Bookmark the permalink.